This is the second in the Winter Rowing series. Check out the first post for considerations on whether you should own a Rowing Machine: How to Increase Your Fitness this Winter by Rowing. 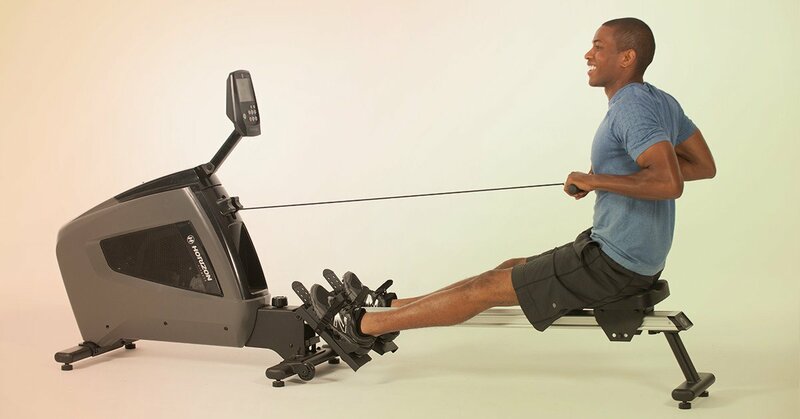 Want to get started using your Rower? Because getting on and off of a rowing machine is so simple and there are no cords or power sources to work with, rowing is one of the most convenient workouts to couple with body weight strength training. Ready to give it a try? Here are a few workouts that will strengthen your entire body and your cardiovascular system. If you’re just getting started using a rowing machine, you’ll want to work up to building a base level of fitness and emphasizing proper form. The demands that rowing will place on your upper body and core, may mean that you will benefit from breaks from the rowing machine during your workout to work other aspects of fitness. This approach gives you the chance to reestablish your form and results in an effective workout that will fly by quickly. Start with 5 minutes of warming up on your rowing machine. Set the resistance to a light to moderate level. Emphasize pushing strongly with your legs from the start position. Once your legs have fully extended, pull the bar to your rib cage, while squeezing your shoulder blades together and down. Think about drawing your belly in tightly to support your low back throughout the movement. Once you have completed the pull, bend your knees and return to the starting position. During your warm up, work up to a steady heart rate of 65-70%. Take a break from rowing to complete a strength circuit. This will include one minute of holding a plank position (knees are fine if needed), one minute of sitting in a squat position on a wall, and 30 seconds each of Banana/Hollow Hold and Superman (repeat twice). Follow this with one minute of releasing the low back and shoulders in Child’s Pose. Repeat both Phases I and II up to 4 times; working up to a full 20 minutes each of strength training and rowing that will target your entire body. During the second through fourth circuits, you can increase the intensity of your rowing effort to maintain a 75% heart rate during these phases of your workouts. Follow your final strength circuit with a bit of flexibility and mobility work, including stretches for the quadriceps, low back, and shoulders, such as that provided for Workout II. Once you have established a strong aerobic base (four to eight weeks of conditioning at the endurance level described above, intense interval sessions are a challenging workout to bring into your training. The Horizon Oxford 5 provides you with an on-board option for race day training that can be a fun way to see your progress. You can also create your own race day environment by rowing for distance and working to meet or beat your own time. You can intersperse your sprints with additional strength training to maximize your workout. Here’s an example of this approach. 500 meters at an easy pace. Concentrate on form as described above. Step up the pace to beat your warm up time during the next 500 meters. Two minutes max effort unweighted squats. How many can you complete during this two minute break. 500 meter row for time. Try to beat your pace from Interval I. 2 minutes max effort push-ups. How many can you complete during this two minute break. 500 meter row for time. Try to match your pace from your previous best Interval of I or II. Three minutes of easy rowing bringing your heart rate down to 60% of your max. Finish with Child’s Pose with shoulder release, Hero’s pose, and Legs up the wall (30-60 seconds or more each). As your fitness increases, you can also increase the distance of your intervals to 1000 meters or more for one or more of the intervals. Rowing machines provide a powerful, portable, and effective option for indoor training and building upper body and core strength. These workouts can be adapted to your needs by providing active recovery and building cardiovascular endurance and give you the option to train intensely. Your rower will complement other forms of training, including running, cycling, swimming, and weight lifting, but can also stand alone as a training option for all individuals. Choosing the right machine will ensure that you have a comfortable option for hard training, endurance building, active recovery, or maintaining fitness that is responsive to your needs and body type.